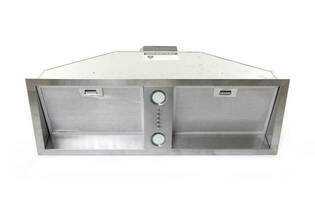 Snapshot: The Schweigen HN-9UM is an undermount rangehood with controls underneath the hood. But how well does it remove steam and cooking smells? This Schweigen rangehood is not part of Schweigen’s “silent” range. The silent range doesn’t have the motor in the hood; instead it is installed through the roof and sits under the eaves or on an outside wall. Our lab can’t test “silent” rangehoods with an externally mounted motor.